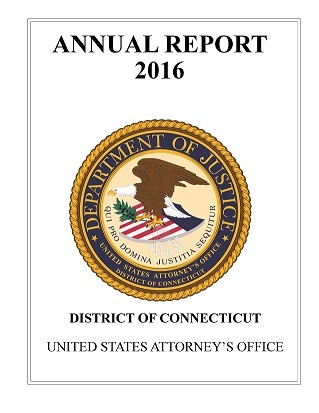 Deirdre M. Daly, Acting United States Attorney for the District of Connecticut, announced that BENJAMIN HOGAN, 34, of Southington was sentenced today by U.S. District Judge Janet Bond Arterton in New Haven to 21 months of imprisonment, followed by one year of supervised release, for participating in a scheme to direct illegal contributions into the campaign of a candidate for the U.S. House of Representatives. HOGAN also was ordered to pay a $5,000 fine. According to court documents and statements made in court, in August 2011, the State of Connecticut applied for a court order enjoining Roll Your Own (“RYO”) smoke shops from continuing to operate without complying with state law governing tobacco manufacturers. RYO smoke shops are retail businesses that sell loose smoking tobacco and cigarette-rolling materials and offer customers the option of paying a “rental” fee to insert the loose tobacco and the rolling materials into a RYO machine, which is capable of rapidly rolling large quantities of cigarettes. Customers did not pay a tax on the RYO cigarettes when rolled by the RYO machines, in contrast to cigarettes purchased over-the-counter. HOGAN was an employee and part-owner of Smoke House Tobacco, a RYO smoke shop with two locations in Waterbury. Fearing that the Connecticut General Assembly would enact legislation harmful to RYO smoke shop owners’ business interests during the 2012 legislative session, HOGAN and others engaged in a scheme to direct conduit campaign contributions into the campaign of Christopher Donovan, a candidate for the U.S. House of Representatives. At the time, Donovan was also the Speaker of the Connecticut House of Representatives. As part of the scheme, the co-conspirators recruited multiple individuals to serve as conduit contributors to the campaign. These individuals permitted checks to be written in their own names to the campaign, and HOGAN and other conspirators reimbursed them with cash, thereby concealing the fact that RYO smoke shop owners were contributing to the campaign. In November and December 2011, participants in the scheme made four $2,500 conduit contributions to the Chris Donovan for Congress campaign. HOGAN was aware of the purpose of the contributions and that the contributions were being made in the names of others. On approximately January 31, 2012, the Chris Donovan for Congress campaign submitted to the Federal Election Commission (“FEC”) a report of campaign committee’s receipts and disbursements for the period October 1, 2011 through December 31, 2011. The report falsely stated the source and amount of the four $2,500 contributions that were received and deposited by the campaign committee during that time period. On May 14, 2012, HOGAN, Harry “Ray” Soucy and Paul Rogers met at Smoke House Tobacco where Soucy provided Rogers with $10,000 in cash to be used to reimburse additional conduit contributors. Prior to the meeting, HOGAN had approached Waterbury business owner Daniel Monteiro and an employee of Monteiro’s and asked them to serve as conduit contributors. Monteiro subsequently wrote a $2,500 check to the Donovan for Congress campaign, and his employee obtained a bank check in the amount of $2,500. Both were assured that they would be reimbursed. These two checks, and another $2,500 bank check drawn on HOGAN’s own account but not in his name, were given to Soucy at the meeting. Rogers also gave Soucy a fourth $2,500 check from a conduit contributor that was payable to a political party. Soucy then delivered the four checks to Donovan for Congress campaign manager Joshua Nassi. On April 12, 2013, HOGAN pleaded guilty to one count of conspiracy to make false statements to the Federal Election Commission and to impede the FEC’s enforcement of federal campaign finance laws. Rogers, Soucy, Monteiro, Nassi and three others have also been convicted of charges stemming from this scheme. This matter is being investigated by the Federal Bureau of Investigation and is being prosecuted by Assistant United States Attorneys Christopher M. Mattei and Eric J. Glover.